Results: Battle of the Songs: Rock-n-Roll Girl Power! This is very late because I had a stressful week at work where I would just come home and sleep. But, here is the results for the Battle of the Songs: Rock-n-Roll Girl Power! What is Your Go-To Song For Spooktacular Halloween? Yes, the magical, spooky time has finally come upon us! Some of us will celebrate it by trick-or-tricking, watching scary movies, or perhaps going to a party in a costume. Whatever you do on Halloween, this frightful night cannot be complete without music! Two years ago, I mentioned, as my go-to Halloween tune, “On Our Own” by Bobby Brown that was featured in the 1989 featured film “Ghostbusters II”. It is one of my favorite new jack swing songs. I could play it over and over again. Yet, I decided this time to mention something different and from somewhere else than the United States. I wonder what song it is? Remember last month I said that I was going to start a brand new segment on this blog? I am able to start that now due to a hectic schedule I have. I might just make this segment into a bi-weekly or monthly segment because I am just so behind on other stuff. Let me introduce the first artist for New Discoveries: akai SKY. 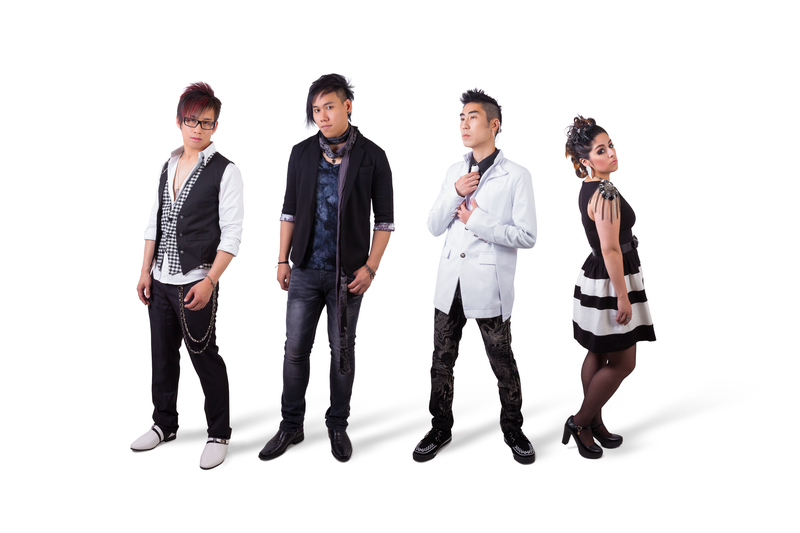 A Jrock-style band from the United States that has been around for ten years. They started to perform covers of Japanese rock songs and anime themes until one day, they wanted to start producing their own music. According to the bassist Umi, the band “combine(s) Japanese and English lyrics to create a new and unique sound”. Ten years ago, we were a bunch of kids who formed a band to play covers of our favorite Japanese Rock and anime theme songs. We quickly discovered that playing covers just wasn’t enough and strived to create something entirely new. Influenced by a wide breadth of musical styles and genres, we combine Japanese and English lyrics to create unique music that bridges the gap between American and Japanese music while representing the Rock music we fell in love with so many years ago. They released their first album entitled “Tokyo Beat Riot” in 2010. They become internationally recognized when they contributed to the L’arc-en-Ciel tribute album “Vivid Covers”. Now, five years after their debut album, akai SKY is back with their third album “Chasing Lights” on August 23rd. The song starts off somewhat softly with a strong bass line supporting the drums and the calm vocals. Then, the intensity grows throughout the first verse and pre-chorus. This is because this song is described as a “dramatic waltzy rock song”, according to Umi. That is why one of the best parts of the song is at the chorus when the guitar and vocals parts are blaring with lots of emotions. The guitar part eerily reminds me of Nickelback’s “How You Remind Me” as they have the same loud and rigid tone. These tones and emotions help to bring out the song theme of “never having someone control your life” very well. My favorite song from akai SKY has to be “Break Down”, a song from their 2013 EP “Heart, Attack!”. I think the reason why I like it so much because its high energy. I always had a soft spot for pop-ish rock songs like this one. I looooooooove it’s sound, from the guitar to the vocals to just about everything else. It’s a great contrast to “Marionette”‘s deep and melancholy character. The song is also unique because I don’t really hear this kind of song in today’s Japanese rock scene. A lot of today’s popular rock groups are acoustic bands or infuses electronica into the rock sound. However, “Break Down” is totally different from the modern J-rock scene as it’s so fresh and upbeat. It makes you crave more of that pop-rock sound in a J-rock setting. akai SKY’s discography is a tasteful opus, featuring several different musical genres that can appease the listeners’ diverse taste buds. Their songs have strongly shown the band’s main focus to listeners; providing an original sound that is unique and one kind. You can find more information about their new album or the band here at their official site. By the way, the band will have a special masquerade themed live performance in San Francisco to celebrate our 10th Anniversary and EP release on Aug. 23rd. They will also have an upcoming show in Dallas, TX at AnimeFest. Today, we are going to travel back to the 1970s where peace flourished in most parts of the world, scandals happened, and musical tastes became more diverse. Rock music evolved and changed as new sub-genres were founded such as hard rock, progressive rock, and glam rock. Hip-hop became a new trend primarily in the Black American community thanks to many artists like Grandmaster Funk. Disco, a new type of dance music, flourished in the night clubs, made new terms like “boogey down” popular, and set fashion trends with the afro, bell-bottom pants, and platform shoes. Even though the 70s pioneered many new musical trends, it still kept a few memories of the 60s alive. Some of these memories were prog(ressive) rock, pop rock, and art rock. By the start of a new decade, bands like ELO, Yes, Genesis, and others experimented with new forms of rock with success. Genesis’ “The Lamb Lies Down on Broadway” album with art rock, Yes’ “Roundabout” with prog rock, and ELO’s “Mr Blue Sky” with pop rock all had influenced the music world by unique instrumentation and brand new musical concepts. Soon after, the whole world caught on to this diverse rock sound craze and tried to emulate it for their own musical scenes. Tulip was a Japanese band who wanted to try these new rock sounds out. Based in southern Japan (Kyushu), Yoshida Akira, Soda Shinji, and Suehiro Nobuyuki came together in 1971 while studying at Seinan Gakuin University. The band played at various lives around campus, trying to emulate the Beatles’ sound with their first song “Hashiradokei ga 10jihan”. The band decided to head to Tokyo and try getting a record deal soon after. However, Soda Shinji and Suehiro Nobuyuki decided they didn’t want to leave Fukuoka and quit. That led the band to recruit Zaitsu Kazuo for vocals, keyboard and guitar, Himeno Tatsuya for vocals, guitar, and keyboard, Abe Toshiyuki for guitar, and Ueda Masatoshi for drums. Tulip signed a deal with an indies label when they got to Tokyo and released two singles, “Hashiradokei ga 10jihan” and “Watashi no Chiisa na Jinsei”. On September 20, 1972, they made their major debut with the single “Mahou no Kiiroi Kutsu” on the label Shinko Music. For the next seventeen years, the band would have numerous hit songs like “Kokoro no Tabi”, “Saboten no Hana”, and “Niji to Sneaker to Koro”. The band also had many lineup changes as most of the members, except for Zaitsu, left the band during the 80s and were replaced by new members Miyagi Shinichiro, Ito Kaoru, Tanno Yoshiaki, and Takahashi Hiro. The band sadly broke up in 1989 after they released the album “Well”. Most of the band members went onto do other activities with the lead singer Zaitsu Kazuo continuing on his mediocre solo career. Some of the band’s members got back together in 1997 to celebrate the band’s 25th anniversary. However, the band stayed together for a ten year period, releasing more material during their revival. The band recently reunited in 2012 to celebrate forty years by holding a concert. 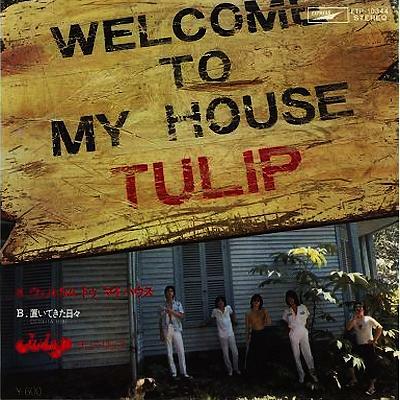 Five years after Tulip made their major debut, the band decided to release their first English song, “WELCOME TO MY HOUSE”. As a well-crafted “progressive meets pop and art rock” song, “WELCOME TO MY HOUSE” reminds you a lot of ELO’s “Mr. Blue Sky”. Both songs feature various musical influences by the Beatles, a lively, bouncy piano sound akin to something found in Paul McCartney’s song “Come and Get It“, and adopting everyday objects as musical instruments. But, what makes ELO and Tulip different from each other is how each band composed their own sound. When writing “WELCOME TO MY HOUSE”., Zaitsu Kazuo probably wanted to feature more of a musical style that was found in the album “Sgt. Pepper’s Lonely Hearts Club Band” within the song. “WELCOME TO MY HOUSE” focused more on the soft electric guitar, piano, and drum sound with a lot of John Lennon-inspired backing vocals. Meanwhile, ELO had always wanted to be a rock band that “pick[ed] up where The Beatles left off” by featuring more styles from the “White Album” and even later evolving from the Beatles sound to their own sound. ELO’s music was often a mixture of rock music, orchestras, and electrical sound properties. Although, the same-titled album can be classified as pop rock, I feel like the song itself can be considered as a mixture of progressive, pop, and art rock. If you listen to it, the song does have a certain pop-like quality, especially by the upbeat attitude often associated with songs composed in cut time. Now, “WELCOME TO MY HOUSE” has the basic rock instrumentation with no orchestral instruments present. The song instead features new innovations in the 70s’ Japanese rock scene with unusual percussion and using the backing vocals to paint a bigger picture within the song; a common theme in art rock. As for the progressive rock sound, the song accents a folk music-like structure, which was very popular in Japan during the album’s release, and changing time signatures from cut time to a slower meter by the end. If you like The Beatles or ELO, then you should most definitely check out “WELCOME TO MY HOUSE”. Named as the Japanese Paul McCartney, Zaitsu Kazuo brings the vocal and musical composition of The Beatles while using the up-beat tempos and piano of ELO in this song. This post is dedicated to my dear mom who is a huge Beatles and rock fan. Without her, I probably wouldn’t have the entire The Beatles discography mesmerized by heart or known English rock music really well. Most importantly, this post wouldn’t be written. I contacted my mom, who always gave me a very detailed explanation, whenever I was uncertain about something written in this post. I want to say a big thaaaaaaaaaaaaaaank you for 1,000 views and 600 visitors! I first saw the news on my phone during break time at work and broke out into a happy dance! Now to our weekly installment of Reporting Live (old name was Live Report). By the time I saw the next artist, it was the last day of my spree to see free lives around the city during the glorious Golden Week. This artist has become prominent this year as he gained more responsibility over the creation and production of several famous girl groups’ songs. Today’s Reporting Live is how I saw the amazing Takui Nakajima and why he brought me to tears. 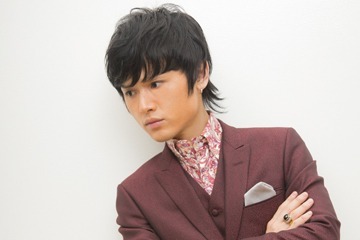 For those who are not familiar with Takui Nakajima or the Hello! Project fandom, don’t worry, let me give you a recap! Takui began his career in 1994 when he joined the indies visual kei band MAGGIE MAE, a name inspired from a Beatles’ song, right after he moved to Tokyo. The band stayed together until 1998 when they decided to break up. A year later, Takui debuted on the label Sony Music Records with his first name only in caps serving as his artist name. He released his first single, “Triangle”, under the label. After the start of the millennium, Takui decided to jump labels as he went from Sony Columbia to an indies label before settling at Up Front Works. Maybe the switch to an indies label and a lesser-known one (Let’s face it, artists in Up-Front Agency at that time, who were not part of Hello! Project, were less well known) helped him more as he continued to create more of his own music and receive the freedom to experiment different musical genres. You could say a lot about his music. But for me, his music is filled of influences from the Beatles (which he is a big fan of and so am I), soft rock, hard-core rock, visual kei, blues, and beyond. I can’t really talk much about the live event because honestly, I was late for it. My friend and I decided to eat Domino’s Japan, a rarity in my daily life because it’s sooooooo expensive here, after spending the hot Sunday morning at a zoo nearby. After finishing eating a late lunch, we realized that it was 2:40 pm. The live started at three o’clock, oh no! After casually walking to the station and riding the train, I barely made it to Sakae Station at three, a location where my friend and I decided that we would go on our own treks for the late afternoon. It was my first time visiting Nagoya Parco’s Tower Records, so I didn’t know exactly where I had to go. See, the problem was that there were three Parco buildings. And because I decided not to pay attention to the store’s online event information, I decided to go and search for the store in the wrong building. As I reached the top, I realized my mistake and had to run down the stairs and go to the correct building. By the time I made it to the store, it was 3:18 pm! Takui already had already performed half his setlist! When I entered, Takui was performing an amazing cover of “Back in the U.S.S.R.”. It was full of energy and so lively that most of audience were dancing and/or clapping their hands in a subtle way. Actually, the audience at this live event was the opposite of any fans at a Hello! Project event. At those events, most fans are men who are dressed in a color-coordinate style of their favorite member, armored with glowsticks, and performing their extreme fan chants throughout the songs. At Takui’s lives, the fans are mostly middle-aged women, some with babies, who are swaying to the beats, eyes beaming at him like he is some musical Jesus or something. It was complete silence, something I thought to be nice but eerie at the same time. I feel guilty of missing out on the first half because he performed some awesome songs like “Taiki Bansei” and “Tsugi no Mado wo Magare”. Nevertheless, the last song he performed was one of the best songs I have heard live for a long time. He started the song out with a mellow ambiance, just strumming mindlessly with only his guitar and singing the song. Half way through, he changed keys and started to sing a powerful rendition of “Stand By Me”. The way he performed with such power and emotions bought me to tears. His music moved me emotionally. After he went back and finished “Tokyo Tower”, I wiped my tears while Takui thanked everyone for coming out. It was time to move: I had to go to a certain information desk and preorder the album in order to get an event ticket. The best thing was that it didn’t take a long time to signup for the preorder and get through the event line. I actually went to this event for a friend because she is a huge of Takui. So, after I finished preordering, I went to the line, waiting for no less than five minutes. He was a really nice and kind person as he talked to everyone for an extended time and even saying hello to the babies and patted their arms that came up with their mothers. As I approached him, I shook his hand and told him that my friend from America said hi and that she loves him. He laughed and said “Thank you very much”. He signed a picture of himself, gave it to me, and we said our “goodbyes” and “see you next time” when I started to leave. If you haven’t of this guy or his music, YOU SHOULD! I am not trying to yell at you or make you do it by typing everything in caps, but I strongly suggest listening to his new album. Takui is an amaaaaaaaaaazing performer who has a lot of talent that needs to be heard more through the musical world. My friend recommend me the fast-paced, staccato-filled rock “Tsuzukerou”. It reminds me of a visual kei-type of song or something related to Tsunku.